From small apartment buildings to towering high rises, most multi-story structures rely on an elevator system to quickly transport employees and guests to their selected floor in a smooth, timely manner. While once polished and professional, the daily wear and tear put on your elevators can quickly diminish their aesthetics and functionality. Your elevator cab interior, for example, will see a lot of use throughout a standard day. Over time, this daily grind will begin to show, resulting in a number of aesthetic issues. Beyond your elevator’s interior, the doors, shell, and components can also show signs of aging. It’s important to find quality elevator parts to replace your outdated, worn-out components. Kohtler Elevators is proud to be your source for the best elevator doors, cabs, and entrances in the industry. By focusing on delivering the best products with the best service, our elevator specialists are able to provide the best outcome for your structure. While our ANSI-certified company strives to deliver the best elevator parts in the industry, we understand that many property managers are not eager to spend capital where they do not have to. 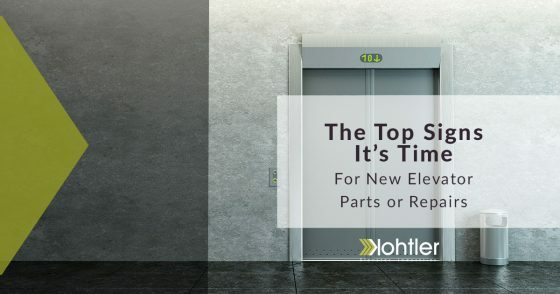 Today, we’ll highlight a few of the most prevalent signs that it’s time for you to repair or replace the various components on your elevator. When done, be sure to contact us to see how we can optimize your elevator cabs and doors! The purpose of today’s elevators is to operate as smoothly and as quietly as possible. This seamless movement is done to ensure longevity for your elevator parts in addition to keeping occupants calm. Any squeaking, thudding, clanking, or banging can be a telltale sign of mechanical issues. If you put off checking this problem, the sounds will likely worsen, creating more stress amongst your tenants and more repair costs draining your bank account! The quiet operation of your elevator system should be accompanied by smooth movements. Any jerky actions or sudden stops can be very jarring for inhabitants. If your elevator cab comes to a stop roughly, the risk for injuries begins to increase. If your elevator is not moving smoothly, it could be a big warning that the components moving your cab may be in need of maintenance. Failing to address this can increase the risk of elevator jams in addition to low rider satisfaction. Speed and convenience are what make elevators the lifeblood of big buildings. If your structure’s inhabitants are having to wait longer than usual for the cab to arrive or for the elevator doors to open, it may be time to invest in repair measures. Not only does this snail’s pace affect the overall productivity of your building, but it can also be a warning sign that your hoisting motor, pulleys, or cables are having issues. It can be hard to diagnose the exact problem here, as a wide range of issues may be present. Faulty elevator doors can struggle to open, increasing the wait time for your guests and employees. While built to optimize reliability, elevators can break down and require repairs to continue safe, efficient operations. If you’ve noticed a marked increase in service calls over the past few months, it may be a sign that there are mechanical problems with your system that are likely getting worse each day. It’s important to investigate this issue to find the source of your repair requests. Otherwise, you’ll be stuck spending countless hours and dollars repairing the wrong component while your elevator cab is at risk for failure from a different part. In either case, we recommend seeking out a professional elevator company for assistance. Operating and maintaining your elevator system is essential for the safety and productivity of your building. When certain components start to wear down, it’s a good idea to look for quality replacements to save you from future problems. You want to provide the safest ride for your building’s inhabitants, and our elevator company wants to supply the best equipment for the job. Kohtler Elevators is proud to be a national provider of quality elevator parts and services. Our top-notch products and experienced staff ensure that you are receiving the best outcome for your time and money. Contact us today to learn more!